Developers have shown sign of hunger for sites as they put up bullish bids for a plot at Perumal Road – the first land tender for 2017. 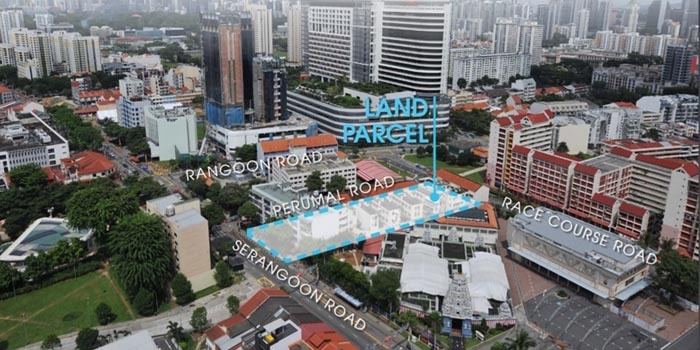 The Urban Redevelopment Authority (URA) has said that the mixed-use plot have drawn a total of 11 bids from various property developers – with Low Keng Huat submitting a top bid of S$174.08 million (or S1,000.70 psf ppr). The top bid was approximately 4.4% higher than the 2nd placed bid of S$166.7 million by China Construction Development. The 99-year leasehold site (spanning across 3,847.8 square metres) is expected to yield an estimate of 200 residential apartments, with commercial spaces situated on the first level. It has a maximum GFA (gross floor area) of 16,161 square metres. Property analysts have noted that property developers are actively looking to replenish their fast-depleting land bank and the Perumal Road site is being presented to them at an affordable price due to its plot size. It was added that developers are seemingly more aggressive with their land bids in the last few years as Government cuts supply under the Government Land Sales (GLS) programme. The Perumal Road site tender has drawn 9 bids which are higher than the top bid received for a site at Sturdee Road (currently Sturdee Residences) in Mar 2015 – which was only S$787 psf ppr. As experts are expecting the property market to stabilise and recover by 2018, it will put the new launch project at Perumal Road in a favourable position by then. They have also mentioned that the potential selling price for this new project will be above S$1,700 psf due to the high price paid for the site.